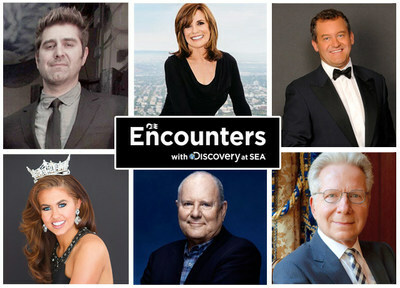 SANTA CLARITA, Calif., April 4, 2019 /PRNewswire/ -- Princess Cruises' newest and largest cruise ship to sail from the West Coast – Royal Princess – offers guests a unique opportunity to hear from an impressive line-up of celebrity speakers as they sail to the sunny Mexican Riviera. Now through April 27, 2019, Royal Princess departs on seven-day cruises to the Mexican Riviera from the Port of Los Angeles (San Pedro, Calif.) before heading up for a new Alaska season in early May. Princess Cruises has the longest history of any cruise line to sail from the Port of Los Angeles, not to mention its celebrity status as the ocean-going co-star to the many exciting stories of romance and adventure on the high seas on the hit TV series, "The Love Boat." "With the recent debut of Royal Princess on the West Coast, we're excited to share with our guests a group of dynamic and noteworthy celebrity speakers," said Denise Saviss, vice president, entertainment experience at Princess Cruises. "With motivating personal stories, poignant life moments and career highlights to share, our guests are sure to walk away impressed and inspired." Michael Westmore is a renowned make-up artist best known for his work in various Star Trek productions, winning nine Emmy Awards. He is a member of the prominent Westmore family and is part of the fourth generation to serve Hollywood as a make-up artist. His career began at Universal Studios in 1961 and spanned four decades, including partnering with the CIA creating make-up kits for spies overseas. He won an Academy Award for Best Make-Up in 1985 for his work on the film Mask. John Mauceri's distinguished and extraordinary career has brought him not only to the world's greatest opera companies and symphony orchestras, but also to the musical stages of Broadway and Hollywood, as well as the most prestigious halls of academia. Regarded as the world's leading performer of the music of Hollywood's émigré composers, he has taken the lead in the preservation and performance of many kinds of music and has supervised/conducted premieres by composers as diverse as Debussy, Stockhausen, Korngold, Bernstein, Hindemith, Elfman, Ives, and Shore. As an accomplished recording artist, Mauceri has over 70 albums to his name, and is the recipient of Grammy, Tony, Olivier, Drama Desk, Edison, Cannes Classique, Billboard, two Diapasons d'Or, three Emmys, and four Deutsche Schallplatten Awards. Best known for his work on the Discovery Channel television program Mythbusters, Tory Belluci is an American television personality and model maker. He is often considered, by fellow MythBusters Kari Byron and Grant Imahara, to be more of a daredevil and, as such, often performs the more dangerous stunts when testing a myth. These have included: testing the "Red Flag to a Bull" myth; testing the myth that a human's tongue will instantly stick to a frozen pole, in the "Snow Special" episode; and the myth "can you stay underwater for an hour while breathing through a dart tube?" in the "Ninja Movie Myths 2" episode. Paul Burrell is a former staff member of the British Royal Household. He was a footman for Queen Elizabeth II and later butler to Diana, Princess of Wales. Since her death in 1997, Burrell has been featured prominently in the media in connection with her, and since 2004 as an occasional entertainment show celebrity. In 2003, Burrell released his memoir A Royal Duty, which follows his career as a member of the Royal Family's staff. It deals in detail with his time as butler to the Prince and Princess of Wales at Highgrove House in Gloucestershire, his move to Diana's staff at Kensington Palace after her divorce from Prince Charles and Burrell's acquittal on theft charges. The book was an international best-seller. Cara Mund is an American beauty pageant titleholder from Bismarck, North Dakota. In June 2017, she was crowned Miss North Dakota and in September 2017, Mund was crowned Miss America 2018 in Atlantic City, New Jersey. Along with the title of Miss America, she received a $50,000 scholarship. Mund is the first contestant from North Dakota to win the Miss America title. She is also the last Miss America to ever compete in the swimsuit portion of competition. During her reign, Mund served as the 2018 National Goodwill Ambassador for the Children's Miracle Network Hospitals and worked closely with the USO. Royal Princess is a MedallionClass ship enabled by the OceanMedallion, the most advanced wearable device in the global hospitality industry, delivering a hassle-free, personalized vacation that gives guests more time to enjoy what they love most about cruising. Award-winning features aboard Royal Princess include the large atrium or "Piazza," offering enticing entertainment and culinary delights; the overwater SeaWalk – a 60-foot-long glass walkway standing 128 feet above the ocean; an expansive Lotus Spa and adults-only Retreat Pool and Sanctuary. One of the best-known names in cruising, Princess Cruises is the fastest growing international premium cruise line and tour company operating a fleet of 17 modern cruise ships, carrying two million guests each year to 380 destinations around the globe, including the Caribbean, Alaska, Panama Canal, Mexican Riviera, Europe, South America, Australia/New Zealand, the South Pacific, Hawaii, Asia, Canada/New England, Antarctica and World Cruises. A team of professional destination experts have curated 170 itineraries, ranging in length from three to 111 days and Princess Cruises is continuously recognized as "Best Cruise Line for Itineraries." In 2017 Princess Cruises, with parent company Carnival Corporation, introduced MedallionClass Vacations enabled by the OceanMedallion, the vacation industry's most advanced wearable device, provided free to each guest sailing on a MedallionClass ship. The award-winning innovation offers the fastest way to a hassle-free, personalized vacation giving guests more time to do the things they love most. MedallionClass Vacations will be activated on five ships by the end of 2019. An activation plan will continue across the global fleet in 2020 and beyond. Princess Cruises continues its multi-year, "Come Back New Promise" – a $450 million-dollar product innovation and cruise ship renovation campaign that will continue to enhance the line's onboard guest experience. These enhancements result in more moments of awe, lifetime memories and meaningful stories for guests to share from their cruise vacation. The product innovations include partnerships with award-winning Chef Curtis Stone; engaging entertainment inspired shows with Broadway-legend Stephen Schwartz; immersive activities for the whole family from Discovery and Animal Planet that include exclusive shore excursions to onboard activities; the ultimate sleep at sea with the award-winning Princess Luxury Bed and more. Three new Royal-class ships are currently on order with the next new ship under construction, Sky Princess, scheduled for delivery in October 2019, followed by Enchanted Princess in June 2020. Princess previously announced that two new (LNG) ships which will be the largest ships in the Princess fleet, accommodating approximately 4,300 guests are planned for delivery in 2023 and 2025. Princess now has five ships arriving over the next six years between 2019 and 2025. The company is part of Carnival Corporation & plc (NYSE/LSE: CCL; NYSE:CUK).